If the Chevy lineup were a football team, the 2014 Chevy SS would be the running back, with a muscular, athletic exterior that reflects the power that lies under the hood. The SS brings back Detroit muscle in modern form with an aggressive front fascia that slowly tapers to the rear to help manage airflow and a low, wide stance similar to a bulldog. After a long hiatus, Chevy is finally bringing back a rear-wheel-drive sedan with a whole lot of oomph. 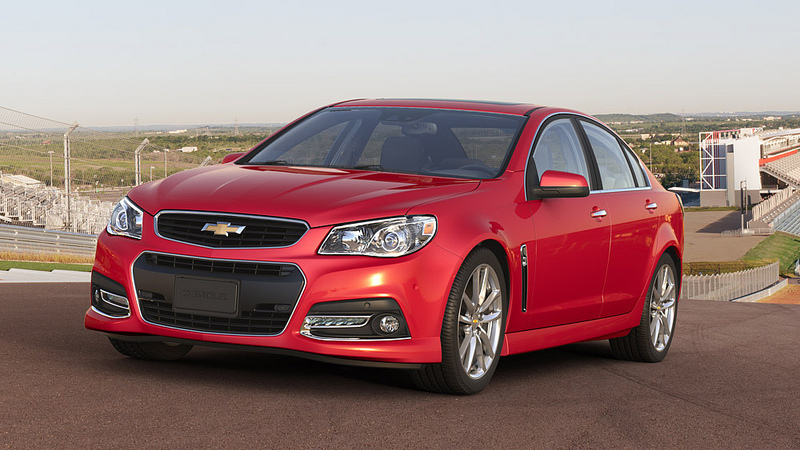 The 2014 SS gets 415 horsepower from the 6.2-liter V8, capable of reaching 60 mph in 5 seconds flat. TAPshiftÒ and StabiliTrakÒ Electronic Stability Control combine to create optimal performance. The 2014 Chevy SS doesn’t get the most spectacular fuel economy with only 17 mpg combined, but the power its 6.2-liter engine provides makes up for the trips to the gas pump, adding a bit of boost to the performance of the SS. With a lush interior, sporting a leather steering wheel and audio controls, the 2014 Chevy SS combines luxury with race car-like performance. Hand-crafted, soft leather seats and decorative stitching offer stylish accents, while the roomy backseat shows that Chevy isn’t trading comfort for performance. The Head-Up Display projects your speed, turn-by-turn directions, and more onto your windshield, directly in your eye line so your eyes can remain on the road. Add the Chevrolet MyLink, and you’re connected 24/7 with everything you want and need. Technology plays a key role in the safety of the 2014 Chevy SS with Rear Cross-Traffic Alert that warns the driver about crossing traffic from behind, while Side Blind Zone Alert and Lane Departure Warning use more radar sensors to alert you of any possible dangers around you. If a collision does occur, OnStar Command Center is automatically informed and uses GPS to find your location and alert authorities.